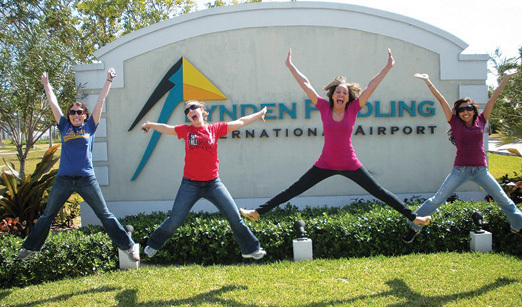 Nursing seniors (l. to r.) Christina Day, Dana Lindsey, Ashley Forman, and Afsheen Gulamhussain make use of their time during a layover at the Nassau airport in the Bahamas. As part of the nursing school’s Alternative Spring Break in March, they worked with island nurses in clinics and conducted health education in schools in Eleuthera. Watch a movie made by these and other students on the Bahamas trip.